Copywriter | Portfolio | Marketing Flyers . Written to convey a message of patient safety and service levels. The company had recently been chosen as a sole distributor of certain branded medicines and wanted to send a message to its pharmacist and medical clients that service levels would be high. The tone had to be professional, reliable and confident. Independent pharmacists and dispensing doctors around the UK. At UniChem, we understand that you expect more than ever before from your wholesaler. That’s why we are 100% focused on you. Throughout August we are offering trade reductions of up to 25% on many health and beauty lines. Prices are checked against our competitors so you don’t have to hunt for the best deals. Offers apply to singles too, so there is no need to carry extra stock. Over the coming months we are also launching exciting new Professional Services and new category offers, so watch this space! 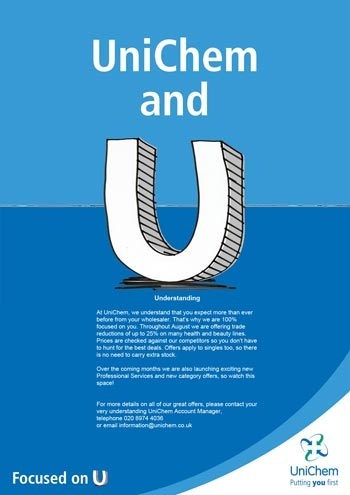 For more details on all of our great offers, please contact your very understanding UniChem Account Manager.